The PleatPak and Magic Bag are patented multidimensional packaging concepts, by function and design that provide added-value to food and QSR brands, as well as the highest customer satisfaction. 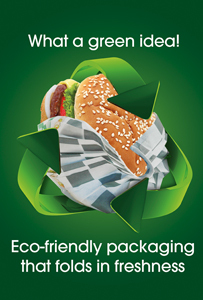 Research has found the PleatPak and the Magic Bag to be the most environmentally sound fast food packaging in the industry today. A unique and intriguing pleated practical package design provides the expectations that consumers seek. Self enclosed folded pleats “hugs” and surrounds the food holding all ingredients together and providing less mess by keeping the hands clean during consumption; while at the same time providing superior product quality holding attributes. The lateral pleats create and leave a hot barrier around the food even during consumption. 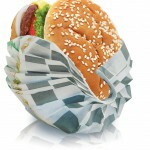 The PleatPak is made from far less material than any other sandwich packaging in its category. It is a novel package designed for most sandwiches. GreenDustries unique technology and intriguing pleated package design has been thoroughly tested and received great reviews from both consumers and operators. PleatPak was designed to protect food quality while at the same time enhancing customer satisfaction and convenience by making sandwiches easier, more convenient and neater to consume. Additionally, PleatPak offers new marketing opportunities for existing promotions of new and existing food products. 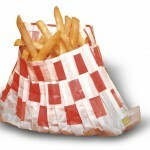 The Magic Bag for French fries/finger foods is made of less material than traditional paperboard fry cartons. Along with our patented source reduction design and use of 100% recycled paper (no virgin fibers), this makes our products environmentally responsible. The Magic Bag is a novel pleated flexible container for french fries and other finger foods. GreenDustries unique and intriguing, patented pleated design has been thoroughly tested and has received great reviews from both consumers and operators. The Magic Bag is designed to protect food quality while at the same time enhance customer satisfaction and convenience by making french fries and/or other finger foods easier and neater to consume. Additionally, the Magic Bag offers promotional marketing opportunities for existing, new, or upcoming food products. Because of the nature of our business, our customers are critical not only to our corporate success but to our success in achieving our corporate environmental commitments as well. We will develop and maintain relationships with customers and to help them progress on sustainability issues. Through our pursuit of better, more resource efficient packaging and environmentally responsible paper options we will provide more value to our customers while at the same time achieving our environmental goals. Yes: http://www.twitter.com/GreenDustries, you’re welcome register! Thank you Jennette! Great Andre, come back soon. http://www.greendustriesblog.com. Thank you! Hey. Mainly needed to leave a brief commentary and enquire where you acquired your particular web theme I might be opening own blog and sincerely like your specific template. Scotty, check our business website and you will understand : http://www.greendustries.com. Become our friend at:www.facebook.com/GreenDustries. Thank you! Greetings from Los angeles! I’m bored to death at work so I decided to browse your blog on my iphone during lunch break. I love the info you provide here and can’t wait to take a look when I get home. I’m surprised at how fast your blog loaded on my mobile .. I’m not even using WIFI, just 3G .. Anyways, fantastic site! Hi, Check our business website : http://www.greendustries.com, much more info! Thank you. Did you go to: http://www.greendustries.com? More info there…. Thank you. Hi, go to :www.greendustriesblog.com for more blogs, and Clemente be happy…Thank you! This website has got lots of very helpful information on it! Thanks for informing me! Hi there, simply was alert to your weblog thru Google, and found that it’s truly informative. I am going to watch out for brussels. I will appreciate if you continue this in future. Lots of folks can be benefited out of your writing. Cheers! Hi, We are posting in a regular manner! Check for the new one. Thank you!